PITTSBURGH—Carnegie Mellon University English Professor David S. Kaufer has been selected as one of two 2014 Fellows of the Rhetoric Society of America (RSA). RSA is the national academic association for scholars of rhetoric, the art of effective communication. Fellows are designated by the society to honor outstanding and long-lasting scholarship in rhetorical studies as well as to recognize those who "have worked to increase the visibility and influence of rhetorical studies through public lectures, teaching, advocacy or other activities." Kaufer joins 20 current RSA Fellows and will be celebrated at the 2014 RSA Conference in San Antonio, May 22-26. "Professor Kaufer has established himself as a leader in the field through his wide-ranging, innovative, interdisciplinary scholarship on important research questions in communication," said Chris Neuwirth, head of the Department of English in the Dietrich College of Humanities and Social Sciences. "Moreover, he is a visionary educator with a strong record of effective service to the profession. I am delighted that the Rhetoric Society of America has recognized his sustained contributions to the discipline." Kaufer, who joined the CMU faculty in 1980, is a rhetorician with interests in the qualitative and quantitative analysis of rhetoric, writing, and written information and technologies for text analysis and text collaboration. For the past 20 years, he has investigated rhetoric as an art of design and authored three books on the topic: "Rhetoric and the Arts of Design," "Designing Interactive Worlds with Words: Principles of Writing as Representational Composition" and "The Power of Words: Unveiling the Speaker and Writer's Hidden Craft." His interest in technology to support learning and the analysis of written composition and information led to the development of Classroom Salon, a social networking application that engages students in online learning communities. Created by Kaufer and CMU Associate Teaching Professor of Computer Science Ananda Gunawardena, Classroom Salon currently has more than 20,000 users and allows students to share their ideas about texts, news articles and other reading materials or critiques of their writings. 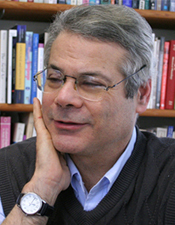 From 1994-2009, Kaufer served as head of the Department of English. He teaches courses in narrative and argument, rhetorical analysis, corpus rhetorical analysis and rhetorical grammar. He maintains active research relationships with faculty within and outside Carnegie Mellon in the disciplines of computational linguistics, computer science, design and information systems, and has created visionary educational opportunities to explore arts of communication across traditional and new media. English Professor David Kaufer (pictured above) joins 20 current RSA Fellows for working "to increase the visibility and influence of rhetorical studies through public lectures, teaching, advocacy or other activities." He will be honored at the RSA Conference in San Antonio, May 22-26.